The catalysts for initiating a Mars Program exist today and include all of the following: geopolitical reality with respect to China and Russia; economic need to stimulate future technologies; and addressing the crisis in engineering and science education, and education in general, facing the United States. Also, deep space operational experience must be regained by continuous generations of young implementers. Finally, and most importantly, there must be a permanent public and political commitment to deep space exploration and development on a par with, and related to a commitment to National Security. A focused Apollo-style management system will be needed. This system must “stay young–stay lean–stay risk takers.” Once the decision to go back to the Moon and on to Mars is made, the sole focus should be to do just that. With such a decision, early tradeoff studies will be needed on interplanetary propulsion development, consumables requirements and sources, specialized technology development, and human spaceflight planning and operations. Additionally, the first landing mission to Mars will drive decisions on development and operations, specifically, crew size and capabilities (one or two crews with one or two landers), desired exploration science returns, space resources delineation and use, and the role of private investment in an integrated program. The success of Apollo depended on the rapid evolution of a management system that, with hindsight, includes many common sense attributes. NASA and its contracting corporations had access to the best engineers and engineering managers available, inherited from the National Advisory Committee on Aeronautics (NACA), the Army Ballistic Missile Agency and Corps of Engineers, assignees from the three military services, the Canadian Avro Corporation, and engineering schools from around the country. Because of the short, roughly 11-year duration of the Apollo Program (Fig. 2), the average age of the NASA and contractor workforce remained below 30 years. Congress should note that this workforce characteristic has been maintained over many decades by an equally complex nuclear Navy with continued success as well as in many other aspects of our national defense establishment. Youth provides the motivation, stamina, patriotism, courage and sense of liberty to see projects to successful conclusions. The bureaucratic newness of NASA in the 1960s also meant that management was minimally layered so that decisions could be made quickly and good ideas could move rapidly to implementation (Note: Between November 1968 and November 1969, a Saturn launch and Apollo space mission took place every 2 months.). NASA also supported an internal, independent engineering design capability that gave managers alternative viewpoints to those of contractors on major issues. Finally, Administrator James Webb persuaded the White House and Congress to provide a management funding reserve sufficiently great to maintain schedule in the face of unexpected engineering issues and accidents. Congress should explicitly define the management responsibility for the program and charge that management solely with the human exploration of deep space and the re-establishment and maintenance of American dominance as a space-faring nation. Congress should give the implementing agency the personnel authority to hire, fire and re-assign employees as necessary to maintain the youth and vigor of the program. Congress should insure that adequate funding reserves are budgeted to account for development unknowns that otherwise would impact scheduled milestones. Congress should commit, as best it can, to an annual, inflation-adjusted funding level for the Moon-Mars-Deep Space Program that would insure the achievement of specific milestones as well as a permanent geopolitical commitment to deep space exploration. Existing NASA Centers and/or elements of Centers with a heritage of developing and operating human spaceflight systems and exploration precursors should come under the direct authority of this implementing agency. Lunar and planetary science and resource identification should be identified as a major component of human space exploration and development initiatives . A full managerial and budgetary separation should be made of space activities not directly associated with the Moon-Mars-Deep Space Program with consideration given to the re-establishment of the National Advisory Committee on Aeronautics and the relocation of non-exploration related space science projects to relevant agencies. With appropriate recognition of our international responsibilities, the International Space Station (ISS) should be utilized for scientifically established protocols to identify as statistically as feasible the adverse physiological consequences and risks of long duration exposure to micro-gravity and to evaluate appropriate counter-measures to those consequences. Consideration of missions to Mars should include the value of returning to the Moon as a means of dealing with many of the challenges Mars presents (Fig. 3). The Moon lies only three days away in regard to Mars mission development, simulation and training versus the many months required to reach Mars. Flying to the Moon and working there require similar deep space operational discipline that new generations of space managers, engineers and flight controllers will need to assimilate. Also, many of the same deep space technological capabilities will be needed. The Moon remains geopolitically critical in its own right. The existence of space consumable resources and potential energy sources  of importance to Earth have not been lost on other international players. Accessing and developing these resources presents the possibility of cost reduction through private-government partnerships. Further, evaluation of the effects of 1/6 Earth’s gravity on physiological re-adaptation will answer the question, for better or worse, concerning the consequences of re-adaptation requirements in the 3/8 Earth’s gravity of Mars. Missions to Mars (Fig. 4) will not be easy for many years to come, if ever. Transit alone presents the issues of radiation protection, micro-gravity countermeasures, consumables supplies, spacecraft redundancy and maintenance, crew proficiency for landing and return, crew composition and crew compatibility, and challenging in-flight work. Solutions to some of these issues may relate to solutions to others; however, many potential solutions require consideration of a return to the Moon to stay. Water, oxygen, nitrogen, hydrogen, methane and other consumables provided by lunar resources can significantly reduce the required Earth launch mass of Mars-bound spacecraft. Among those other potential consumables is helium-3, a potential fuel for fusion-powered propulsion that could shorten transit time considerably. Crew suitability and compatibility for long duration missions can be evaluated with an extended stay at the International Space Station (ISS), followed by an exploration mission on the Moon, and then by another extended stay at the ISS. Mars has enough atmosphere (~1/200th of Earth’s) to cause entry, descent and landing (EDL) problems, but not enough to help much in kinetic energy dissipation. It is generally calculated that a Mars Lander will have an initial mass of at least 40 metric tonnes as compared to the 4 metric tonnes of Curiosity (Fig. 5). This is not a trivial issue. Further, EDL must be accomplished without real-time assistance from Mission Control. Landing, whether automated or not, likely will utilize a beacon operating from a previously landed, un-crewed habitat-supply precursor necessitating a rover-assisted, surface rendezvous after landing. It also is likely that in situ, return fuel production will need to be demonstrated prior to Earth-launch of the paired crewed mission. Whatever approaches to EDL ultimately are developed for operational testing, such tests probably will take place at appropriate altitudes in the Earth’s atmosphere and during simulated Mars landing profiles near the Moon. Also, operational technologies and procedures will need to be developed to support consideration of aborts to a landing in contrast to aborts to orbit. Future lunar landings offer the best means of testing abort-to-land concepts along with doing so with simulated Mars communications constraints. Exploration of the surface of Mars will have many similarities to future lunar exploration. Lunar preparatory missions provide the means of testing, operating and maintaining Mars-consistent equipment such as mixed-mode rovers, sampling and analytical tools, analytical equipment for return sample selection, bio-containment systems for drills and sample packaging, dust mitigation concepts, food production concepts, and nuclear power systems. Of particular importance will be the evaluation of Mars extravehicular mobility units (EMU). Whereas, Apollo EMUs were designed for use over just a few days, Mars EMUs will need to be designed for long duration use and maintenance. 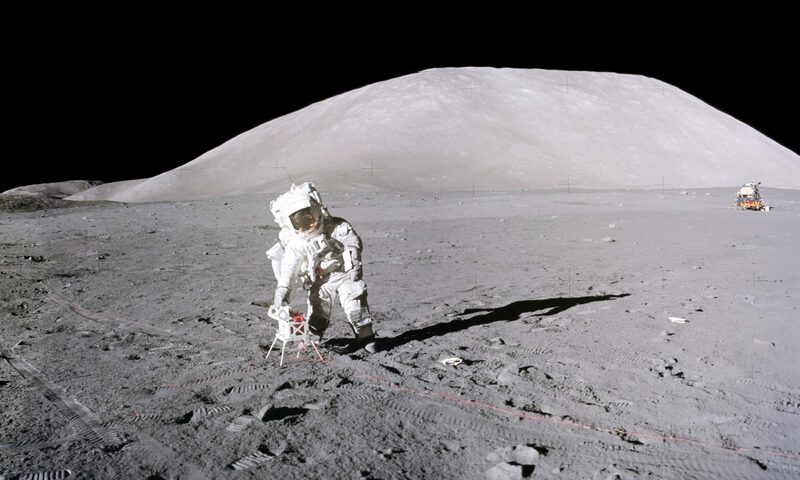 Lunar exploration provides an unique opportunity for testing such systems over extended cycles of use in a realistic environment. Although consumables production (water, oxygen, nitrogen, helium, fuels and food) on the Moon begins with processing regolith rather than the potentially more chemically challenging Mars surface materials, the operational experience with such processing, as well as volatiles refining, will provide invaluable experience in the design of consumables production systems for Mars. It is currently unknown if the 3/8 Earth’s gravity of Mars will trigger gravitational re-adaptation in landing crews and, if so, how much crew time will such re-adaptation require. The integration of a research protocol into future lunar exploration to determine whether 1/6 Earth’s gravity triggers re-adaptation will serve two purposes. If lunar gravity triggers re-adaptation, there will be less complexity in engineering design and operational planning. If this does not happen, then design, planning and development of countermeasures become more complex, but this complexity can be taken into account earlier than otherwise would be possible. Fusion-powered interplanetary booster by 2035 (Public / Private Capital Funding). An essential ingredient to achieving these milestones is the existence of a space launch system capable of accelerating ~100 metric tonnes to escape velocity. Upgrading and fast-tracking the current Space Launch Systems (SLS) to match these capabilities are required objectives in this regard. A return to the Moon appears to be essential to increasing significantly the probability of success of a Mars landing and exploration program and to maximizing the scientific return from such a program. Such a return to deep space exploration, however, requires the unequivocal and sustained commitment of the Nation, even more so than was required for the Apollo Program because of the multi-decadal nature of the effort. Mars also provides a geological integration of the early solar system impacts recorded by the Moon and the contemporaneous water-rich, pre-biotic period on Earth. Mars exploration has the potential to unravel the origin of life on Earth, as well as being a geopolitical imperative for democratic nations. Finally, if a decision is made to move quickly to re-assert United States dominance in space, we are well positioned to do so. The geopolitical environment facing the United States today is as critical as that which faced the Congress and the Eisenhower and Kennedy Administrations prior to Apollo. The technical capabilities available actually significantly exceed those of May 1961. Thanks to leaders in the Congress and NASA, the development of the Space Launch System is well ahead of Saturn V development at a comparable time. The Orion spacecraft is in test rather than just being on the drawing board. Constellation’s Altair Lander design has progressed well beyond that of the early Lunar Module designs (Fig. 1). Unlike the 1960s, the private sector is well positioned to support as well as partner with the government. It is time to move forward sooner rather than later. Lambright, W. H. and Webb, J. E. (1995) Powering Apollo, Johns Hopkins, 101. Kranz, E. (2000) Failure is Not an Option, Simon & Schuster, 119-384. Schmitt, H. H. (2012) Space Policy and the Constitution, America’s Uncommon Sense website, Downloads: Space Policy and the Constitution (PDF link, or PRC Kindle link). Schmitt, H. H. (2006) Return to the Moon, Springer, 335p. Schmitt, H. H. (2015) GSA Spl. Paper 518, 1-16. Braun, R. D. and Manning, R. M. (2007) Spacecraft & Rockets, 310-323. Harrison H. Schmitt is a former United States Senator from New Mexico as well as a geologist and Apollo 17 Astronaut. Dr. Schmitt is currently an aerospace and private enterprise consultant. Dr. Ronald Wells assisted in the final preparation of this manuscript. Condensed from the 56th article and 8th in a series on Space Policy archived on this website here. This document is available in PDF and PRC (Kindle) formats on the Downloads page. Copies of the oral presentation before the Subcommittee are also linked below the longer, written version. In addition, 5 panel members addressed specific questions directly to Dr. Schmitt. These questions and Dr. Schmitt’s answers are also linked there as PDF and PRC files.